Great Britain has had an international agreement for the last 50 years with a small Pacific island. It has been ignored until the death of their king brings it to the attention of the Foreign Office in Whitehall. 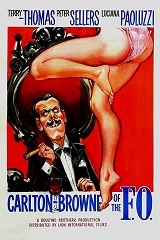 They decide to send Cadogan de Vere Carlton-Browne (Terry-Thomas) to re-establish friendly relations. Also stars Peter Sellers and Luciana Paluzzi.